Halloween is the season for creatures of the night, and there is no better way to light up the darkness this year than with the new Aurora glow in the dark paint from SpaceBeams. A small company started by two brothers, Mike and Steve Grzywacz, from the U.K., SpaceBeams is a creative brand that specializes in glow in the dark products, and their first release is Aurora, a bright green glow in the dark paint. SpaceBeams hopes to expand with new colors and types of glow products in the future. We were excited to put Aurora to the test with a few projects around HDN Headquarters and found it to be an amazingly effective glow paint with virtually endless possibilities, especially around the Halloween season. After seeing something about Aurora, this new glow-in-the-dark paint, I decided to give it a whirl since I’m always doing various kinds of crafts. My package arrived super fast, and I tried it last week and it’s definitely awesome when it comes to the glow for sure. I did a side by side trial run with the Aurora and a can of Rustoleum Glo-Spray I had, and the difference between the two was amazing! 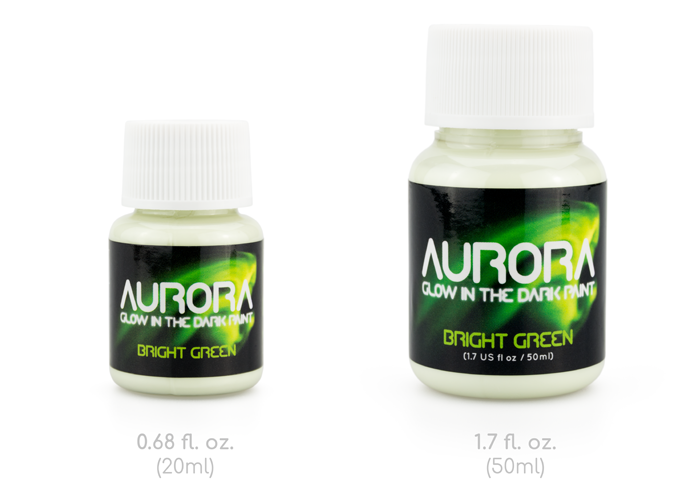 There’s absolutely no comparison between Aurora and other glowing craft products I’ve tried in the past. The others don’t even come close to the clear, bright glow that Aurora creates. I thought I’d see what they had in the Exclusive VIP Area, which is free(!) for a limited time, and easily registered for that on the spacebeams.com website. A couple of days later, I received my access login information and was excited to see lots of different stencil themes and helpful tutorial videos showing a couple of techniques you can use with the patterns. Some look fairly easy, so I can’t wait to test those out too. I just have to figure out where to use them. It does have a rough texture once dry, so I used a few drops of water to smooth it out, which made it easier to spread and followed up with a top coat of clear lacquer, so hopefully, that will keep the Aurora from chipping and/or fading. Honestly, it’s probably good that I didn’t have a few gallons of this stuff, because I’d be tempted to paint the whole house, inside and out, and probably half of the trees on our property too. For now, I think I’ll start with marking our outside stairs because I’m totally blind in the dark and I know it’s just a matter of time before I break my neck. I love this stuff! It’s great for everyday household uses and I can’t wait to use it everywhere. You can order your Aurora glow in the dark paint directly from Spacebeams here, as well as find various new stencils that can be downloaded and used at home.